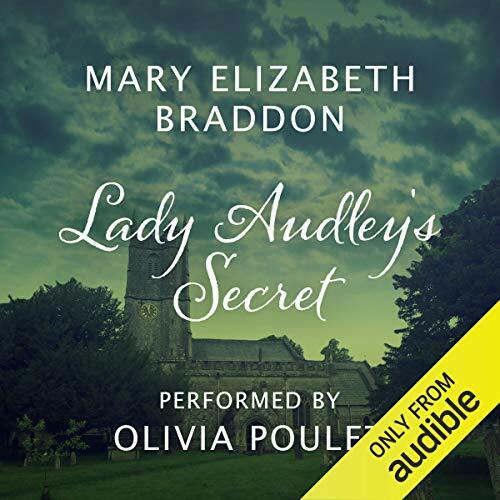 From the author of The Christmas Hirelings comes this Audible Exclusive production of Mary Elizabeth Braddon’s classic sensation novel Lady Audley’s Secret. English actress Olivia Poulet gives an assured and captivating narration; a cornerstone of the genre and a scandal at the time of its publication, Lady Audley’s Secret is an entertaining and shocking tale of high drama and shifting perceptions. Finding herself at the centre of an investigation into the disappearance of a local man, the beautiful yet mysterious Lady Audley must use all her deceit and cunning to prevent the truth being discovered. Published in 1862, Lady Audley’s Secret is one of Mary Elizabeth Braddon’s most successful and well-known pieces of work. A founding text of the sensation novel genre, it delivers high drama with mystery, intrigue and plot twists aplenty. Comfortable in her place as a Lady of Audley Court, the beautiful and enchanting Lucy Graham soon finds her status brought into question following the disappearance of a man recently returned from Australia. As the hunt for the missing man intensifies, the threads of Lady Audley’s story begin to unravel, and our antiheroine must do all she can to prevent her past from catching up with her. Playing on Victorian anxieties about the domestic sphere and social mobility, Lady Audley’s Secret was a scandal for its Victorian audience. Its engrossing secrets and startling revelations continue to shock and entertain to this day. Mary Elizabeth Braddon was a popular English author who earned success in the Victorian era with her sensation novels. Born in London in 1835, she was raised by her mother, Fanny, after her parents’ separation. As a teenager Mary first began working as an actress, but after eight years, and with declining popularity and waning interest, she instead turned to writing. Her prolific output resulted in over 80 novels and 150 short stories as well as plays and articles. Braddon is best known for her novel Lady Audley’s Secret, which combines elements of the detective novel, the psychological thriller and the romantic comedy to become one of the most successful novels of the 19th century. Olivia Poulet is an English actress and screenwriter who made her acting debut in 2001 in episodes of Teachers and The Bill. Born in London in 1978, Olivia attended Putney High School before becoming a drama graduate of Manchester University. With appearances in film and on radio and stage, she is best known for her work on television, starring in the multi-award-winning British shows Outnumbered, The Thick of It, Sherlock and Holby City.